Oh be still my heart! I was waiting to know if Audible would even have book #16 of this series because it seemed they weren’t telling us! They were hinting but … that’s NOT hte same! But the day it was due to be on the shelves in hardback came I got a fan-mail from Smith announcing it, so I checked Audible (one more time) … and there it was – and even read by Lisette Lecat – the reader of the first 15. YES! So I finished the book I had going – Trespass by Rose Tremain – wrote the blog piece and downloaded the Smith book. No-brainer. 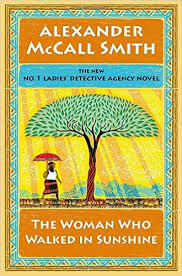 This time Smith’s delightful Mma Grace Makutsi, a partner at the #1 Ladies Detective Agency, has decided that Mma Precious Ramotswe, a woman “of traditional proportions” and the actual owner of the business, needs a vacation. It’s a good time for her to go because business is slow and Mr. J.L.B. Matekoni, the husband of Mma Ramotswe and also the owner of the Speedy Motors Auto Garage,” agrees. Besides, Grace Makutsi really wants to be in charge of the office and they have a volunteer to assist. These are not “crime” novels really – the emphasis is always on the relationships between Mma Ramatswe and Grace, her clients, her husband and others. There are little who-done-its and what’s-going-ons, but those are not the focus. The stories are full of love, common sense wisdom, and humor. In the series’ early novels Botswana is shown as almost idyllic and that was criticized but later books include the poverty, AIDS, diamond mines, women’s issues, crime, corruption, and other issues. That said, Botswana is one of the best countries in in which to live in all of Africa.